Tableau’s interactive features allow users of UW-Madison’s Institutional Tableau workbooks to quickly generate their own tailored reports. This KB article explains how to sort, drill down and filter data to get what you need. One of Tableau’s most useful features is the ability to explore information while keeping the underlying data intact. You can change filters to pinpoint the data you are looking for, drill up or down to view aggregate versus detailed data, use sorting to organize your data and more. You can undo changes you make by selecting the button. You can also undo all changes and revert the dashboard to its original state by selecting the button. These buttons are located in either the lower left or upper left corner of your screen. Some charts allow you to sort in alphabetical or numerical order. 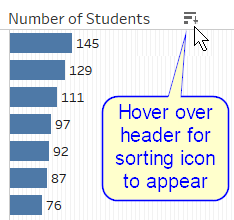 Hover over the column header and click on the sort icon that appears. Click again to toggle between sorting in ascending or descending order. 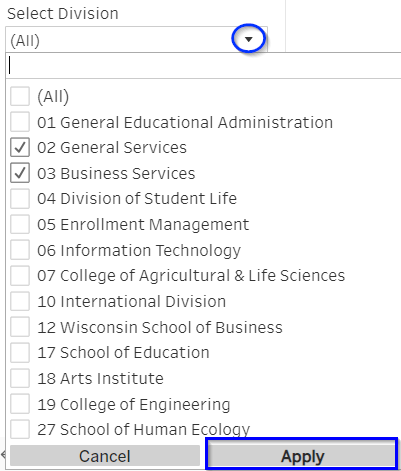 The icon will not appear if sorting is unavailable for that field. Some fields allow you to drill up for an aggregate view or drill down for a more detailed view. To see if a field has this feature, hover over the header and look for a + sign. Filters are located either in the upper left or top of the dashboard and come in a variety of styles. Most filters allow you to choose one or more dropdown options. Other filters contain a text search box. Read more for a description of each. 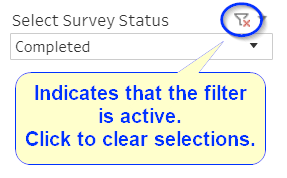 Some filters come in the form of radio buttons. To select an option, simply click on a radio button. To use dropdown filters, select the carrot next to the desired filter and make your selection. 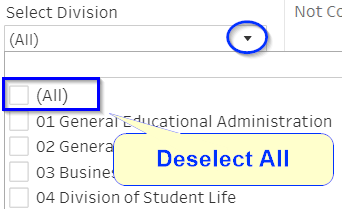 If the filter allows you to select more than one option, you may need to hit ‘Apply’ before your selection goes into effect. After you make selections, a funnel with an x symbol will appear. This indicates the filter is active. Click the funnel to clear your selections and see all values. Some filters come in the form of a search box. To use a search box, enter part or all of a keyword and hit enter. That field will then be filtered to display any entries containing the keyword. 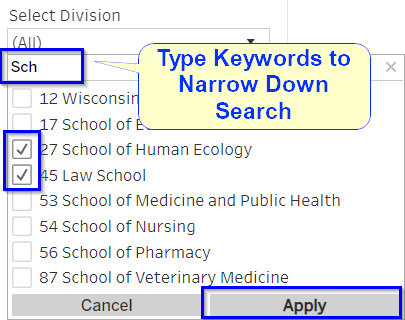 If no matches resulted from your search, try reducing the number words or characters to generate more results. If you have questions about this Tableau document, please contact Melissa Chan, Office of Data Management and Analytics Services (ODMAS) at melissa.chan@wisc.edu.